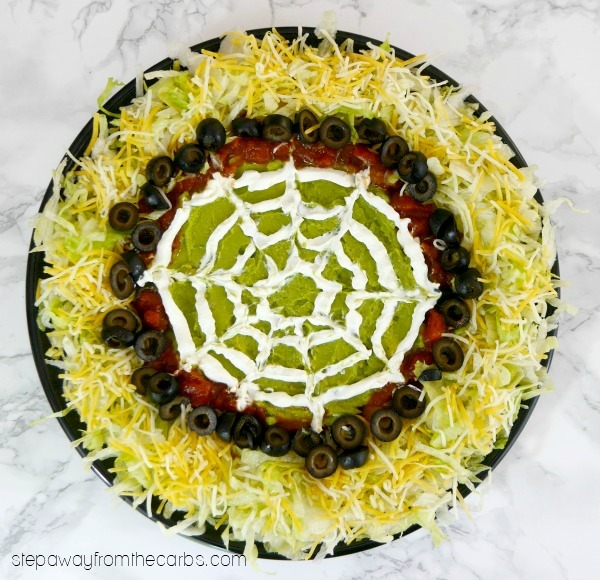 This spider web dip is perfect for a Halloween party! 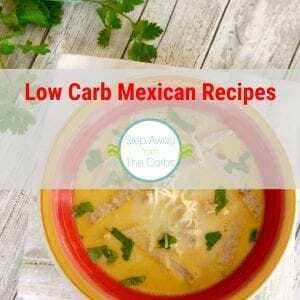 Low carb, keto, LCHF, and gluten free recipe. I confess! I *do* like novelty food at Halloween. 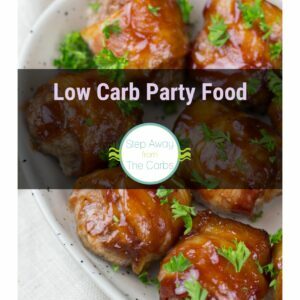 Everything about this occasion is fun and light-hearted, so why not celebrate it with food. 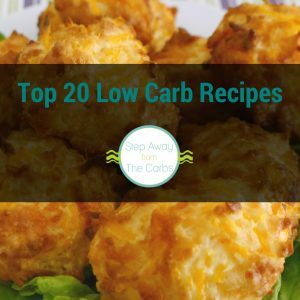 And by food, I mean LOW CARB food. 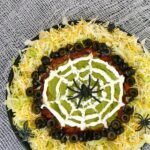 I actually made a different Halloween dip last year – but in the form of a Jack O’Lantern! 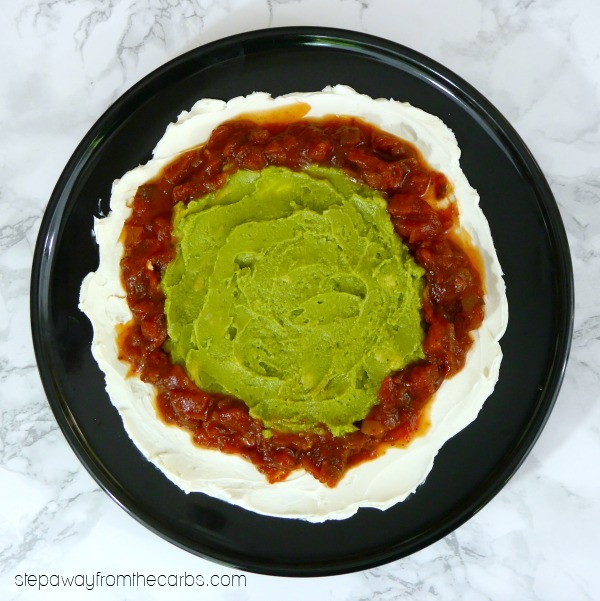 These dips are great for sharing as an appetizer or at a party. Who knows what next year will bring?!?! 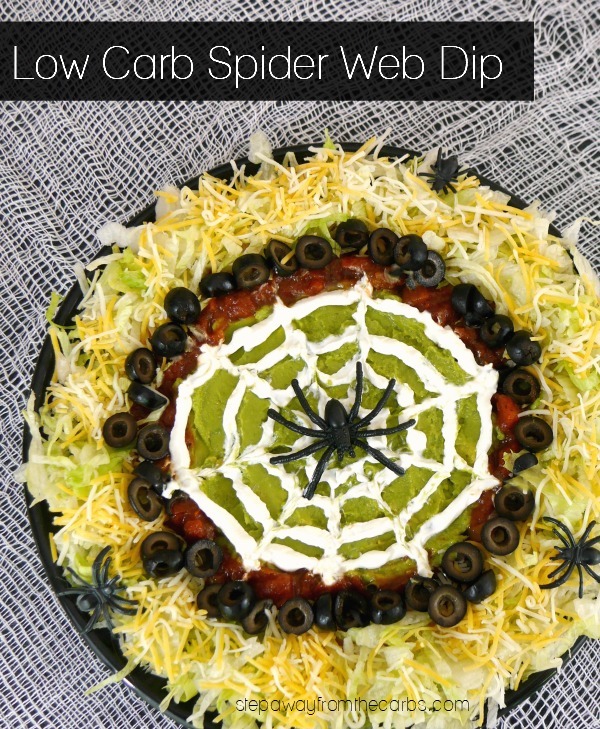 So this spider web dip is formed of several components – but there is no actual cooking involved. 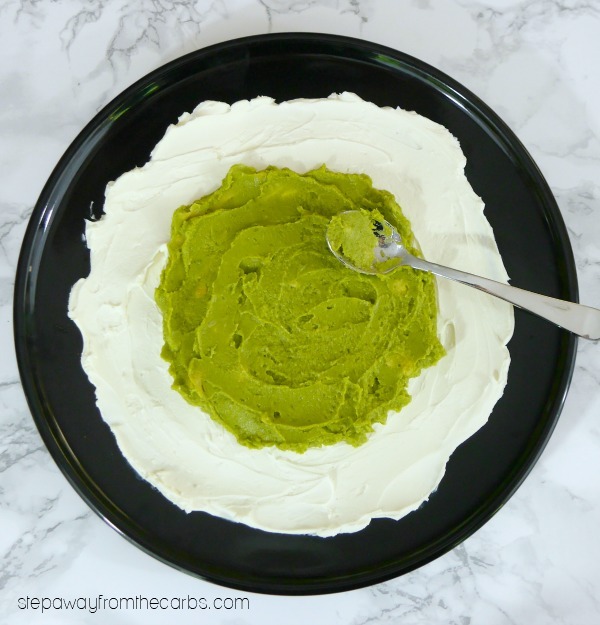 And if you have the guacamole already made (try my easy creamy guacamole! ), then this dish can be prepared very quickly, right up until the sour cream web, which does require a little patience. Start by smoothing some cream cheese over a plate – it helps if the cream cheese is room temperature. Use the back of a spoon to spread it. Then add some guacamole to the center of the cream cheese. Next, add a ring of salsa around the guac. Always check the carb content if you’re using store-bought: some can be high in sugar for no good reason! This Green Mountain Gringo salsa is great! Spread some shredded lettuce around the salsa, covering the cream cheese. Then sprinkle some shredded cheese on top of the lettuce. 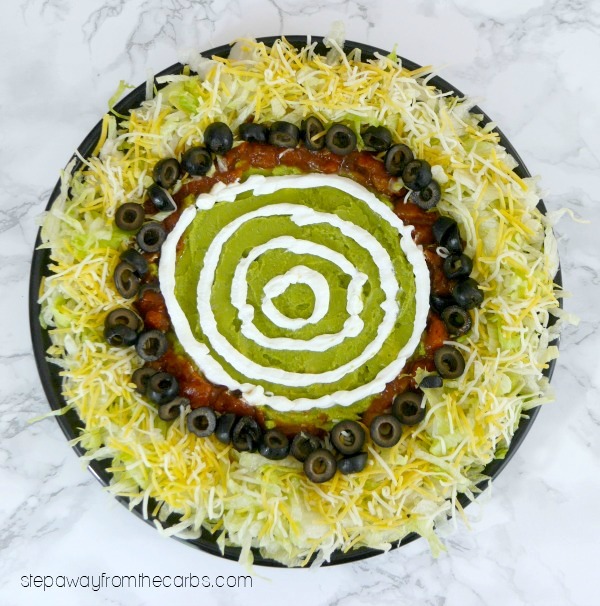 Finish the “rings” with a circle of sliced black olives. And to make the web, spoon some sour cream into a plastic baggy and snip off one corner. 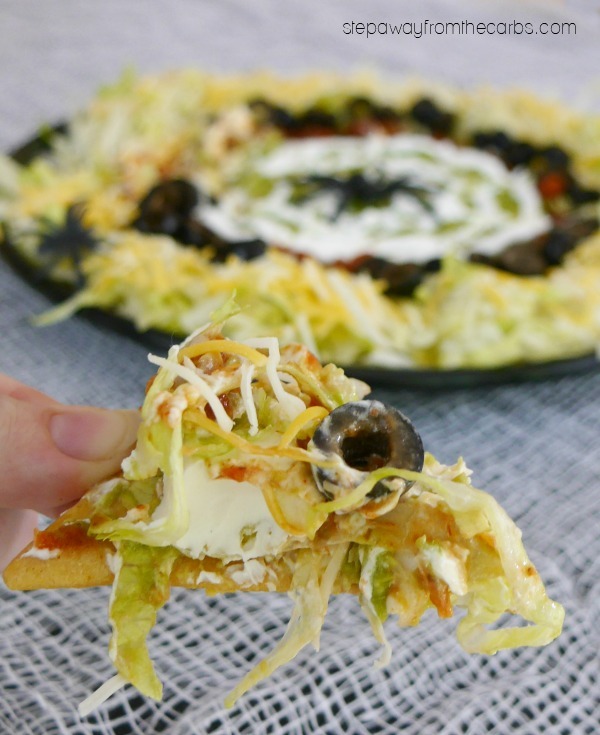 Squeeze the sour cream out and form three or four circles. OK, I could have done them more delicately than this – but I guess I wanted to make sure there was plenty of sour cream LOL! Use a knife or wooden pick to draw lines from the middle circle out to the edge. 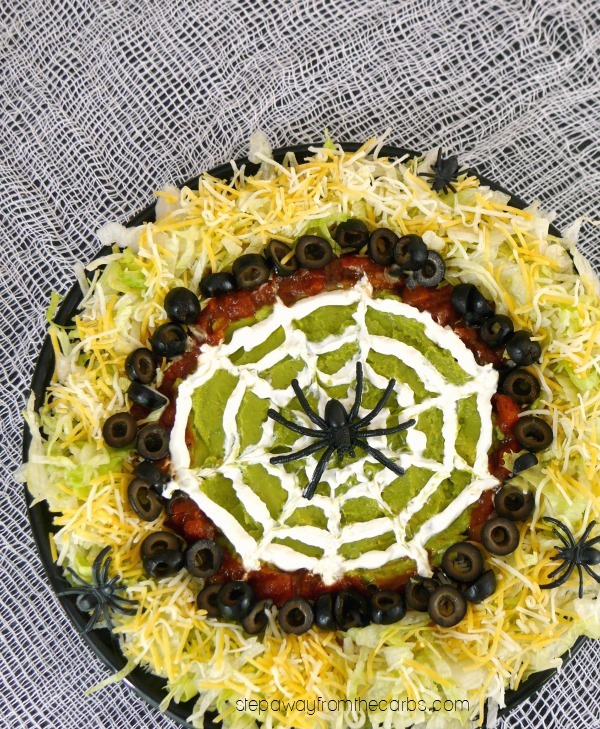 Garnish the spider web dip with a plastic spider – or four! 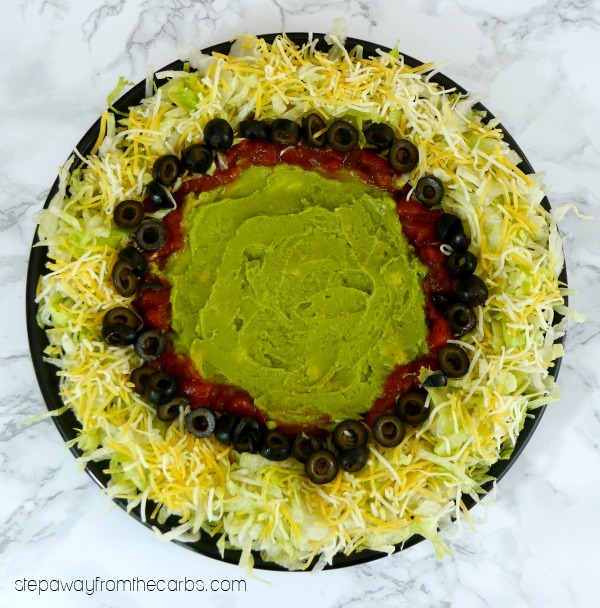 To serve the dip, you’ll need some sturdy chips – you’ll want to dig down to get all those layers so something bendy like cucumber or bell pepper strips may not be the best. Celery would be fine – shown here are low carb corn chips that I get from Netrition (I’m afraid they’re not gluten free, though). 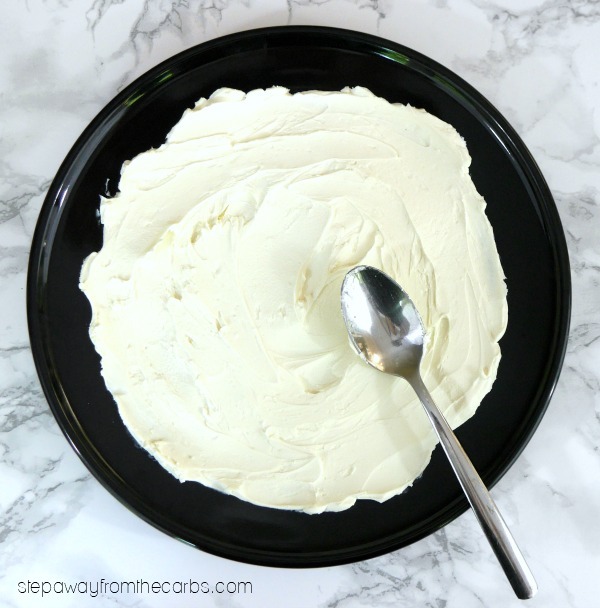 Start by smoothing some cream cheese over a plate - it helps if the cream cheese is room temperature. Use the back of a spoon to spread it. Next, add a ring of salsa around the guacamole. Spread some shredded lettuce around the salsa, covering the cream cheese. Then sprinkle some shredded cheese on top of the lettuce. 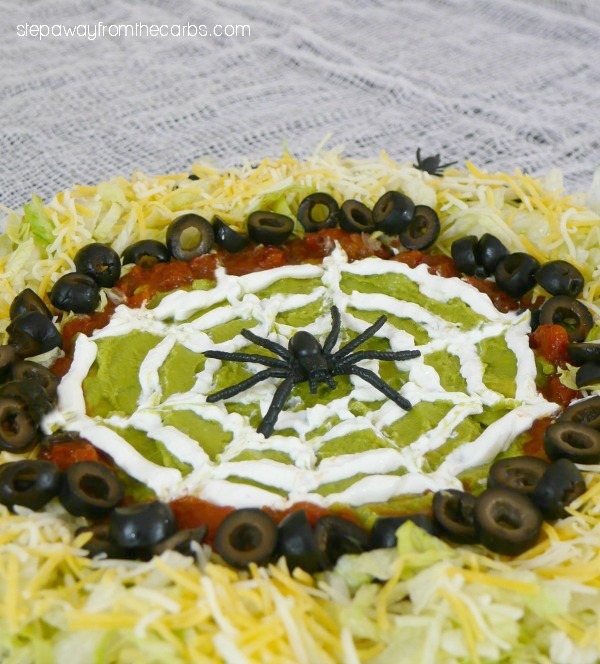 Finish the "rings" with a circle of sliced black olives. Use a knife or wooden pick to draw lines from the middle circle out to the edge. Garnish with a plastic spider - or four! 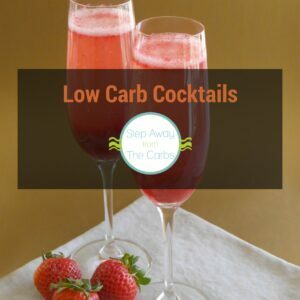 5g net carbs per serving (quarter of the recipe). Inspired by this recipe from Mr Food.